Gnomes and Narwhals: Rooks, Knights, and Bishops, Oh My! The greatest game of all time garners its beauty not only from the intricacy of its elegant design but from its variety of tastefully styled constructions. Chess derives from several ancient games intended to simulate war across the globe, and each contributes to the miraculous game that we all know and love. Specifically, chess draws its origins from the Indian chaturaṅga—a game containing pieces with similar movements to modern rooks, knights, bishops, and pawns, but called chariotry, cavalry, elephants, and infantry—and the Muslim shatranj—which has many similarities to both modern Western chess and the Japanese variant shogi. After chess was adopted into European culture, it fully became the standard F.I.D.E. (World Chess Federation) version we know today. While the game is an abstraction of war tactics and strategy, the design of its pieces gives it a classic and elegant feel that mirrors the brilliance of thought required to succeed in the game. In this regard, there are quite literally hundreds of variants in existence, which attempt to embody and exploit different aspects of the game and explore its further intricacies, whether that be increasing the number of players, the movements of pieces, or the shape and size of the board. Many of these deviations from standard F.I.D.E. chess are wonderfully amusing, and I strongly suggest exploring them at the Chess Variant Pages. With so many varieties in existence, it is easy to see the impact chess has on the people subject to its addictive allure. Years are dedicating to exploring and mastering this game, and, as a result, it has become a quintessence of the human condition. At its heart, chess subsists of pure logic and rational thought. In this regard, it tends to employ the left-brain, which is often favored by society for the progression of accomplishment, in war, business, or development. However, while the game is mastered in understanding and applying this rational thought, the display of chess and the environment it operates in allows for creativity to play its part. 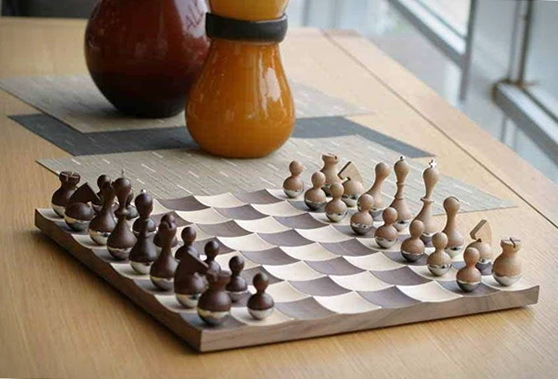 Ergo, chess sets are some of the most brilliant pieces of art. Many sets are traditionally beautiful, with hand-carved pieces or glass boards, many of which can be placed on display in homes for the sake of class and esteem. 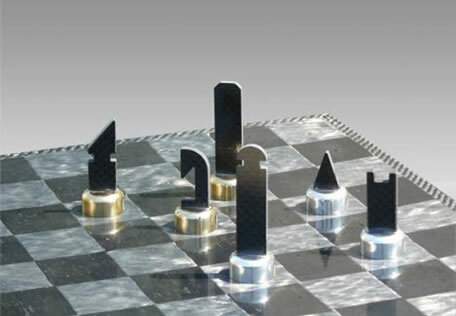 Some sets change the display of pieces, deviating from the traditional Staunton chess set which has been adopted by F.I.D.E. as the standard since 1924. These deviations can sometimes become more concrete, such as using figurines, which are designed as people or animals. Other times, they can become more abstract, such as finding a singular shape to stand for a known piece. Not only are the pieces greatly altered, but the boards themselves can take on dynamic changes, whether that is scale or direction. There are several “life-sized” chess sets around that involve two to three foot pieces on a large ten-by-ten foot board. Also, the boards can have a variety of different colored pieces, separating from the standard black-and-white checkers. The most original design I have found incorporates a vertical board, where the game is played on a wall-hanging by moving pieces up and down a picture-framed surface. Many variations of chess exist, from the concept of the game to the design of the pieces and board, but they all mirror the brilliance of the elegant game.